Modified Fishtail corseted couture bridal gown. Asymmetrical neckline. Hand stitched Swarovski embellished Lace appliqués on the silk Organza overlay over Duchesse Satin base fabric. Hand stitched Swarovski embellished Lace appliqués on the silk Organza overlay over Duchesse Satin base fabric. 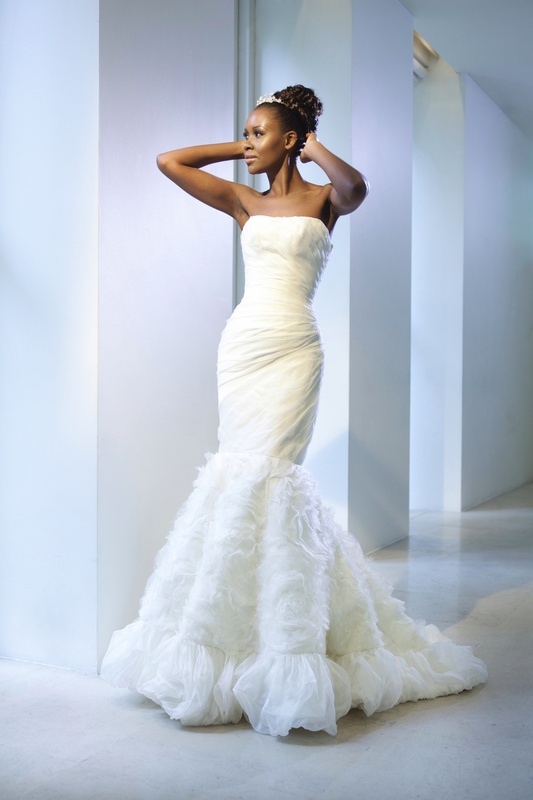 Strapless modified A-Line couture bridal gown. Hand stitched Swarovski embellished Lace appliqués on the silk Organza overlay featuring a chapel train. Sits over Ziberline underdress with a puddle train. Worn over removable Organza chemise with 3/4 length sleeves. 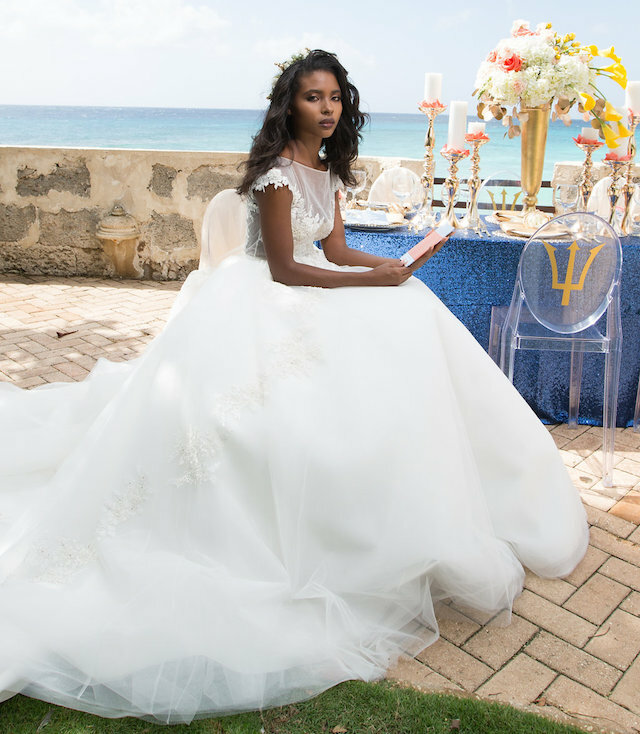 AURELIE – Strapless modified A-Line couture bridal gown. Hand stitched Swarovski embellished Lace appliqués on the silk Organza overlay featuring a chapel train. Sits over Ziberline underdress with a puddle train. Worn over removable Organza chemise with 3/4 length sleeves. Strapless couture bridal gown in Ivory Tulle and Champagne Zibeline. Ruched corseted bodice with Swarovski embellished Lace appliqués. Tea length full skirt. Worn over removable cap sleeved chemise in Ivory Tulle. GISELLE – Strapless couture bridal gown in Ivory Tulle and Champagne Zibeline. Ruched corseted bodice with Swarovski embellished Lace appliqués. Tea length full skirt. Worn over removable cap sleeved chemise in Ivory Tulle. Two piece couture bridal ensemble. Corset top in Antique White Crepe backed Satin with ruched asymmetrical front and low back featuring covered buttons. Worn over chiffon skirt with slits at the side and a chapel length train. MARGOT – Two piece couture bridal ensemble. Corset top in Antique White Crepe backed Satin with ruched asymmetrical front and low back featuring covered buttons. Worn over chiffon skirt with slits at the side and a chapel length train. 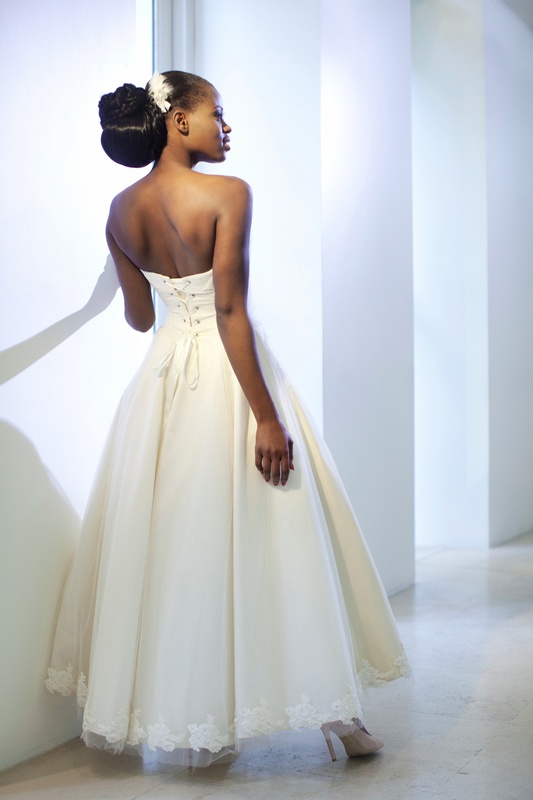 Strapless couture bridal gown in Ivory Organza and Duchesse Satin. Ruched bodice, textured rose swirls details on the skirt and gathered puffball effect around the hem. Chapel length train. Cap sleeved bolero jacket in textured Organza. ODETTE – Strapless couture bridal gown in Ivory Organza and Duchesse Satin. Ruched bodice, textured rose swirls details on the skirt and gathered puffball effect around the hem. Chapel length train. Cap sleeved bolero jacket in textured Organza. Strapless couture bridal gown in White Tulle and Duchesse Satin. Ruched bodice with Black Hand stitched Lace appliqués in an asymmetrical arrangement. Multi layered Tulle skirt with Black appliqués. Chapel length train. Covered buttons down the back. Integral corset. ODILE – Strapless couture bridal gown in White Tulle and Duchesse Satin. 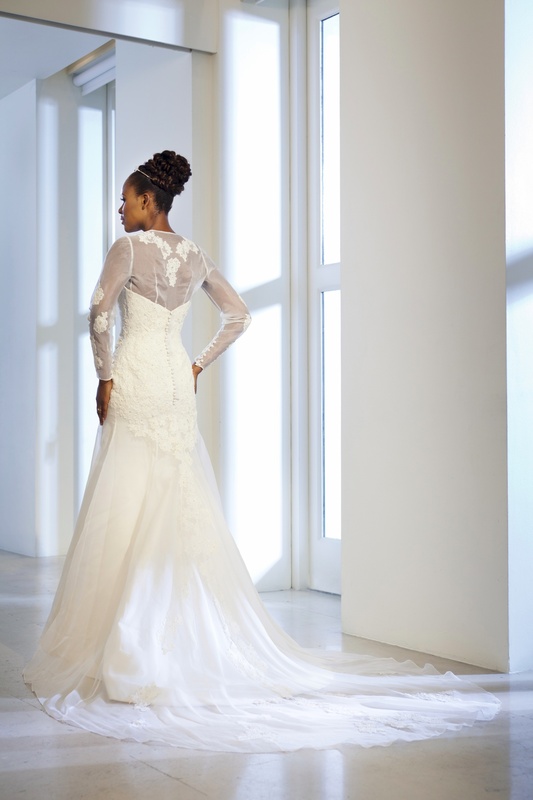 Ruched bodice with Black Hand stitched Lace appliqués in an asymmetrical arrangement. Multi layered Tulle skirt with Black appliqués. Chapel length train. Covered buttons down the back. Integral corset. Strapless couture bridal gown in Antique White Tulle and Silk Taffeta. Lace bodice with Sweetheart and covered buttons behind. 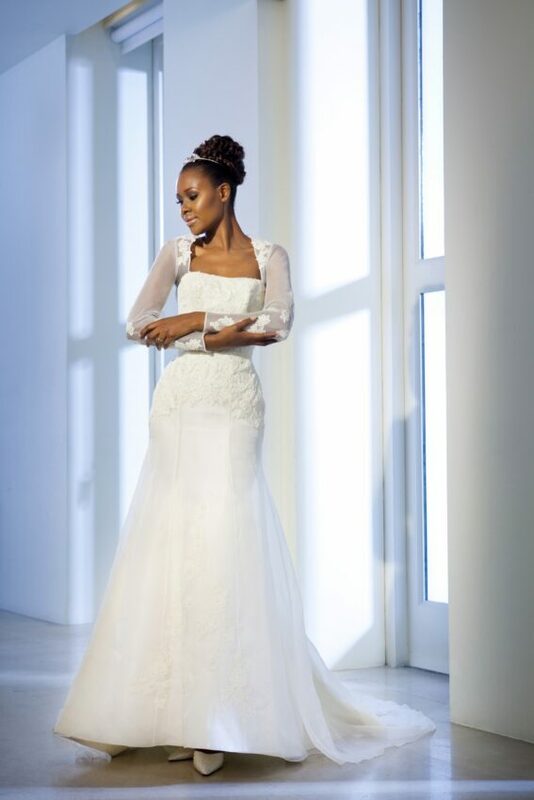 Circular Taffeta skirt with multilayered Tulle overlay embellished with hand stitched Lace appliqués. Cathedral length train. Worn over Tulle chemise with boat necklace, deep V back and 3/4 length sleeves. TITANIA – Strapless couture bridal gown in Antique White Tulle and Silk Taffeta. Lace bodice with Sweetheart and covered buttons behind. Circular Taffeta skirt with multilayered Tulle overlay embellished with hand stitched Lace appliqués. Cathedral length train. Worn over Tulle chemise with boat necklace, deep V back and 3/4 length sleeves.